Meeting at Lower House Car Park at 9:45am, we regularly get between 50 – 70 volunteers turning up to work on the gardens. Activities differ according to ability – everyone is welcome. We clear pathways, build fences, plant trees, chop down trees, clear ponds, work in the Kitchen gardens,… all to repair and conserve the gardens. All tools and gloves are provided. Please wear walking boots or wellies, and wear suitable clothes for the weather (bring waterproofs if it’s wet, and a hat etc if it’s cold). Bring water. Teas and coffees are provided, as is a delicious and warming lunch. There are always donuts in the afternoon! You don’t have to stay the full day, come along and join us for a couple of hours. Family-friendly – There are a number of children who come along, obviously the older they are, the better, for handling tools etc. The youngest volunteer so far is 6 – which is on the young side. 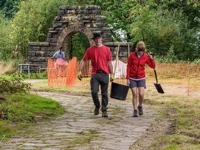 The younger kids (aged 10+) will help preparing food and drinks, as well as work in the Gardens, and we’ll try to take time out to teach some bushcraft skills if we can, however the emphasis is on the garden restoration work. This is also an opportunity for learning – we will be offering training courses in the near future.